Artists, activists, and tech entrepreneurs flock to the bustling city of London, the most populous city in the United Kingdom and England, to introduce their grandest ideas to the world. The city is no stranger when it comes to coworking spaces, which are hubs for entrepreneurs, startups, and freelancers to break free from the setting of the traditional office. It has spaces for a variety of different industries, from tech to nonprofit. London coworking spots especially emphasize ergonomic seating, relaxed interior design, and collaborative communities. 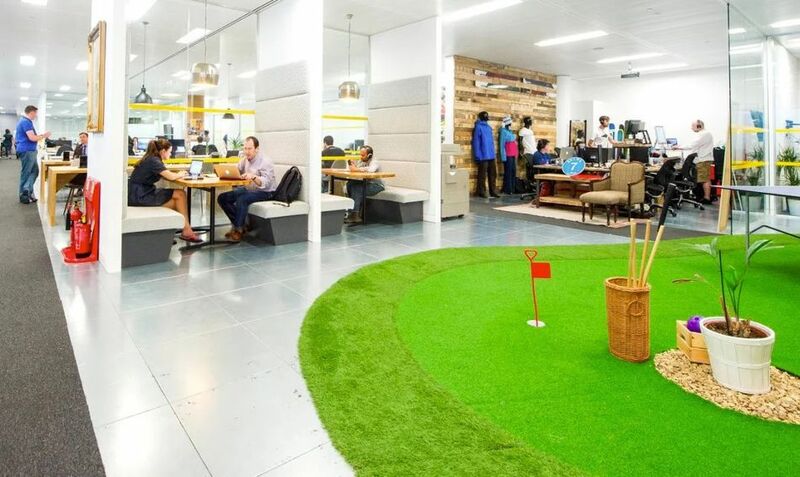 Choosing from London's hundreds of coworking spaces can be overwhelming. You can pare down your list of potential work locations by considering a variety of factors, including your budget, industry, preference for access frequency, and amenity requirements. In this guide, we put together a comprehensive list of London's best coworking spaces, from tech meccas to business clubs. Runway East is a laidback, affordable option for entrepreneurs and teams to work, collaborate, and occasionally drink together. It's a growing business with locations in Moorgate, Shoreditch, and Featherstone, with upcoming venues in SoHo, London Bridge, and Bristol. For individuals, there are a variety of membership options, including hot desks (£199 + VAT per month) and dedicated seating (£399 + VAT per month). Monthly fees for private offices start at £500 + VAT per person, and scaleup spaces begin at £400 + VAT per person each month. All memberships include free access to meeting rooms, high-speed Internet, breakout spaces, and community events — perfect for growing startups. Depending on your location and membership package, other amenities include rooms for relaxing, regular opportunities with investors, cake Wednesdays, runway feasts, cleaning services, showers, lockers, onsite staffing, and printing services. Located in Mayfair, St. James, Bank, and Holborn, The Clubhouse is a formal setting for luxurious businesses. It's an excellent location for meeting with important clients and potential business partners. The organization defines itself as a "unique business club that sits between coworking spaces and member clubs.” Its luxurious offerings are reminiscent of a cross between a hotel and an office. Services include couriers, concierges, call answering, flexible meeting areas, meeting rooms, hot and dedicated desks, virtual offices, phone booths, and lockers. The prices are steep given the various luxuries that you’ll find at The Clubhouse. A "House" membership costs £4,650 + VAT per year with a joining fee of £250. You will get access to invitations and events, priority booking for meeting rooms, and daily access with this subscription package. Executive members and club members pay lower fees but get limited access. The Oval Office is in fact located in London — at least the creative coworking space is. Located off Hackney Road, it houses a mix of nonprofits, tech startups, consultancies, and design studios. Residents have access to TVs and high-end sound systems. The benefits package offers 24/7 access, post handling, kitchen facilities, bookable meeting rooms, fast Internet, daily cleaning, and sound system access. You can inquire about full-time, part-time, and hot desk options through their website. Members can also get access to The Pickle Factory, a music venue, and Oval Space, a spot that hosts music, art, and pop-up events. There are many events, gigs, workshops, and socials that go on in these two locations, which make them great networking locations for artists. TechHub is a dynamic gathering space for growing businesses. Startups will find an opportunity for building business relationships and tackling operation challenges within its walls. Many members attest to its value for helping early-stage startups. There are plenty of events year-round, including talks with guest speakers from places like Google and evenings for finding interns. Membership is geared towards groups and teams for £1,800 + VAT monthly, though individuals can opt for part-time subscriptions for £600 + VAT annually and a resident room for £360 + VAT monthly. Memberships perks include marketing support, a flexible workspace, mentorship, and entrepreneurial programs and events. Subscribers can also enjoy meeting and breakout spaces, high-speed Internet, printing services, a stocked kitchen, weekly breakfasts, and more. Additionally, the online member network allows people to crowdsource knowledge from engineers, commercial specialists, and founders. There is one location in main London and another in Moorgate. With locations in Camden, Interchange is the mecca for London's entrepreneurs, with 84,000 square feet available. It's an organic accelerator that helps startups without taking equity. It offers deals and £1 million in free software to help its members. Its Innovation Lab gathers investors, teams, accelerators, and entrepreneurs to form plans for revenue growth. Interchange hosts events like hackathons, creative panels, and demo days. Monthly fees are £350 for premium hot desks and £450 for dedicated spaces. Day passes cost £40. Amenities for premium members include conference rooms, coffee, a trade mail address, fast Internet, printing services, an on-site cafe, free software, and rentable event space. A coworking space shouldn't shave off most or all of your income. Greenhouse London offers competitive, affordable prices. It is home to many creative individuals, small businesses, and startups. Before committing to a payment plan, you can try out the one-day trial option. On a monthly basis, a 20-hour per week hot desk costs £150. If you opt for a permanent or shared desk, you get access to meeting rooms, event hosting, lockers, and discounts for event spaces and well-being classes — yes, there's even a place for you to practice yoga. Other amenities include business addresses, printing facilities, private phone booths, high-speed Internet, and bike storage. Greenhouse also has a media lab, where members receive access to software such as AutoCad3D and Photoshop. Fun events take place in its space throughout the year, including music gigs, workshops, seasonal markets, and meetups. You will find Greenhouse at locations in Newington Green and Hackney. Huckletree celebrates community, operating as a gathering space for startups, scaleups, innovation teams, and global brands. Members include innovators from tech, lifestyle, and startup brands. You will be able to meet industry experts and participate in exclusive business events as a member at Huckletree. Memberships range from "light" for 10 days from £175 + VAT per month to studios for growing teams at £550 + VAT per month. In between these two options are "unlimited members" who get full access to hot desking zones and breakout spaces as well as "resident members" who receive dedicated desks. Membership perks include exclusive events, private phone booths, meeting rooms, coffee and tea, weekly drinks, and well-being classes. The coworking space also has a broad network of contacts from the tech, media, and fashion industries. You can visit Huckletree at its locations in West London, Shoreditch, and Clerkenwell. Uncommon places a heavy emphasis on wellness in professional environments to promote good health and prevent burnout. It uses calming scents, music playlists, and greenery to form a relaxing and balanced environment for getting work done. The space has ergonomic furniture to support clients in the healthiest ways with standing desks for active movement and chairs balanced for posture. The aesthetic of the work area is minimalist. There are plenty of plants outside of and around the office for a breath of fresh air. Subscribers can choose from a range of seating options, whether they are a single freelancer or growing company. Day passes start at £20 + VAT. Monthly fees for desks are £249 + VAT for hot desks, £350+VAT for dedicated spaces, and £399+VAT for private offices. Amenities include fast Internet, access to multiple locations, coffee, meeting and conference rooms, sports classes, and mindfulness sessions. Uncommon has several locations throughout London, including Highbury and Islington, Borough, Fulham, Midtown, and Liverpool Street. Movers and shakers will find a place to grow their ideas to combat all of society's challenges at London's Impact Hub. The organization describes itself as "part innovation lab, part business incubator, and part community center. " There are three Impact Hubs in London at Islington, King's Cross, and Brixton. Prices vary by location. At King's Cross, monthly membership prices start at £15 for Hub Connect, £90 for Hub 30, £140 per month for Hub 50, £260 per month for Hub 100, and £460 for Hub Unlimited. Different tiers indicate the number of perks that you get. Depending on how much you pay, amenities include unlimited tea and coffee, storage, and a registered post box. Members also get discounted rates on programs that take place inside the coworking space. Events at Impact Hub include talks, business seminars, and panels focused on social impact. All members receive some form of discounts at the organization's programs.